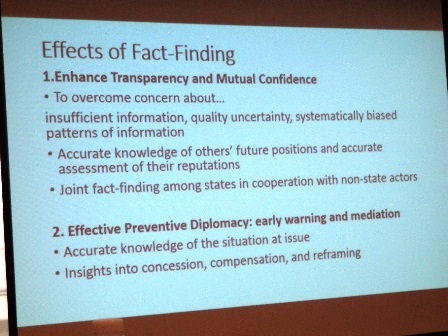 Naoko Kumagai presented the role of fact-finding in preventive diplomacy. Kumagai explained that fact-finding is indispensable for the reinforcement of confidence building and is useful for preventive diplomacy measures, in particular early warning and mediation. Still, Kumagai emphasized the limitations of fact-finding as seen in biased fact collection and interpretations, which often occur even in U.N. human rights reports. Then she pointed out that fact-finding can be paralyzed once mutual confidence among parties is broken. She addressed the importance of fact-finding at the confidence-building level and suggested that a functional approach to fact-finding in technical issue areas would be possible even with the principles of non-interference. 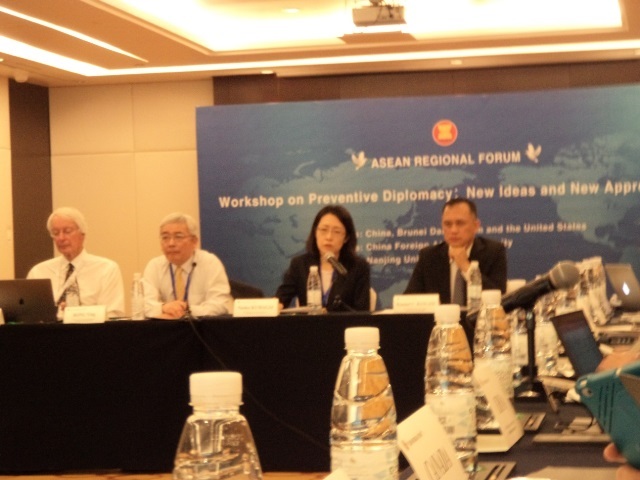 Kumagai suggested an independent ARF office or an office within the ASEAN Institute for Peace and Reconciliation which provides fact-finding mission, stores fact and data, serves as an arena of free discussion over conflictual results of fact-finding without any judgement capabilities, and works as liaison between intra-regional and extra regional cooperation for arranging the most effective fact-finding mission for each case. After the panel, Kumagai received comments sharing the same observation about the growing problem of irreconcilable interpretational disputes over a single fact seen both in domestic and international politics, which often leads to the failure of dialogue itself. The comments also included the importance of serious institutional development for fact-finding missions overcoming such crisis.